Value Creation Through Sustainable Manufacturing. 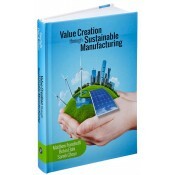 Value Creation Through Sustainable Manufacturing, by Matthew Franchetti, Belin Elahi, and Somik Ghose, is an authoritative guide that presents managers and engineers with proven strategies for implementing sustainable systems and practices in their manufacturing operations. This authoritative book is highly recommended for both students and professionals in the field. Readers will gain a solid understanding of the challenges involved in--and advantages of--sustainability by examining integrated strategies and practical tactics in the context of real-world industry applications. In this discussion, the authors effectively address the issues, costs, and value of sustainable design, environmentally sound resource, process, and facility management, waste minimization and pollution prevention, maximizing energy efficiency and sustainable energy sources, and green supply chain management. A coordinated road map of proven, integrated strategies for creating value through sustainable manufacturing systems and practices applies to a broad range of industry applications and organizations. Ready-to-use assessment techniques, performance evaluations, and economic and cost-benefit analyses, plus case studies, provide guidelines for managerial and engineering practitioners in the field. Clear discussions cover key areas of sustainable manufacturing—from design, facility, material, resource, waste, and energy management to supply chain, logistics, and maintaining sustainability. Dr. Matthew Franchetti (Toledo, OH) is an Associate Professor of Mechanical, Industrial, and Manufacturing Engineering and the Director of Undergraduate Studies for the Mechanical Engineering Program at the University of Toledo in Ohio. He is the Director of the Environmentally Conscious Design and Manufacturing Laboratory and the Principal Investigator for the Business Waste Reduction Assistance Program, a joint effort with local government. Prior to his work in academia, Dr. Franchetti served as an industrial engineer and technical manager for the U.S. Postal Service. A Certified Six Sigma Black Belt and a professionally licensed engineer, he has helped numerous companies reap the benefits of sustainable practices. Behin Elahi (Toledo, OH) is a Ph.D. candidate in Industrial Engineering at the University of Toledo, having received her M.S. in this field in 2011. Her research interests include green supply chain, operation research, quality control, and mathematical programming, and she has published more than sixteen conference and journal papers. Since 2012, Elahi has been a consultant and one of the project managers of the Business Waste Reduction Assistance Program under the supervision of Dr. Franchetti. She is an executive officer for the IEEE Toledo section and a member of the University of Toledo Engineering Council (UTEC), the Golden Key International Honour Society, and the Society of Women Engineers. Somik Ghose (Tokyo, Japan) also is pursuing his Ph.D. in Industrial Engineering at the University of Toledo. He completed his M.S. in the field of Civil Engineering in 2003 and has worked for eight years as an engineer and manager at the Center for Innovative Food Technology/Edison Industrial Systems Center, one of Ohio’s Manufacturing Excellence Partnership (MEP) centers. Ghose has participated in projects involving implementation of water and wastewater improvements, waste-to-energy processes, biofuels, energy efficiency, and renewable energy technologies in the automotive, manufacturing, food-processing industries. Notify me of updates to Value Creation Through Sustainable Manufacturing Sale!